I can explain. It's been one of those days. A day of first-world problems. A day when I keep telling myself, some people have got real problems, but okay, I'll admit it, mothering drove me nuts today. Poor Hugh has now had a bug for over a week and just wants to fight his sister, me and every gargantuan injustice he can. You should'a let me use the red crayon! Earlier, I had to collect the Dyson from the repair shop (why do they deodorize it with essence of car wash?) and the mission led to scuffles with his sister, wailing in the street, vacuum-packed misery. Later, when he was calmer, we saw a woman about my age with greying hair (no dye) and I mumbled in my self-soothing way, see her hair looks nice enough...good on her; he said, Well, mummy, I don't think you should grow your hair grey. Sadly, I know what he means. And yet, I'm still trying to resist the pressure to be a slave to putting chemicals in my hair every 4 weeks for the next fifteen years at great effort, time and expense. Other people might enjoy it, not me. I came home and stuck on a Minnie Mouse hairband to do the Dyson-ing, through wails of protest that it was too noisy and getting in the way of the TV. They are asleep at last and I am gazing peacefully on the pristine red rug and the soft-plum sunset over the west hills of Glasgow. I will fall into bed with mattress-all-mine delight, as Nice Man is drumming in Spain, but of course I look forward to his return, free hotel soaps and otherwise. Totally rocking the mouse chic! 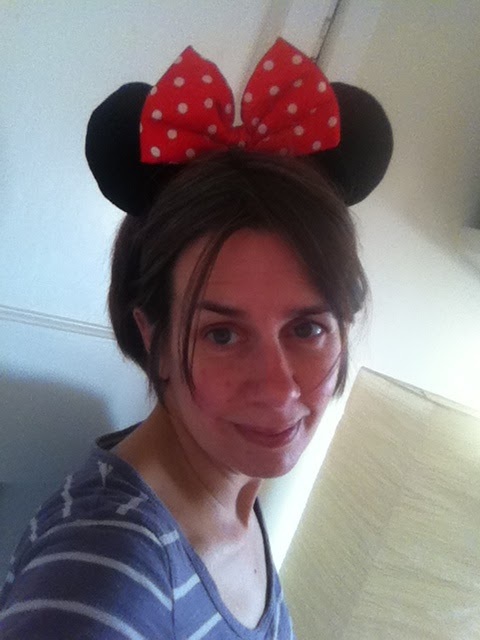 I too have worn Mini Mouse ears, my children are almost grown and still drive me mad. But not as mad as they used to... Mouse ears help. Trying to post a photo of me with mouse ears, but failing. I had it for Facebook profile pic a while ago.